Designer Peter Lamont followed in some giant footsteps. Ken Adam had applied a heavy, but lavish and breathtaking, hand to the look of the early Bond films. Taking over in an era of realism, and some austerity, still allowed Lamont the opportunity to shine. In an exclusive conversation, Lamont remembers his last few Bond adventures, touching on all facets of the production from conception, to recces and shooting. He shares a raft of stories, reaffirming that life on the Bond pictures was often challenging but never dull. 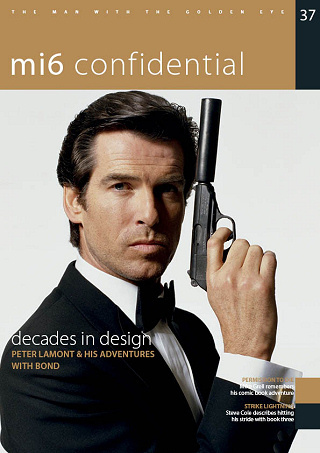 This issue of MI6 Confidential also revisits the promotional partners of the Roger Moore era, investigates the missing Bond novel 'Per Fine Ounce' and hears from author & illustrator Mike Grell on his contribution to the illustrated 007.